In Potion Explosion players attempt to create potions by pulling colored marbles from a dispenser and matching them with the needed ingredients for the potions on the table in front of them. While basic turns are simple, clever players will strategically pull colored marbles that both fulfill a needed ingredient and cause matching colored marbles to stack up in a single column, allowing them to collect all the like colored marbles and save them for later turns. 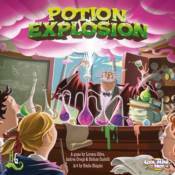 Potion Explosion�s simple rules make it easy enough for the whole family to learn, but offers enough depth to keep puzzle game fans coming back for more.